Left to right: Mayor Pro Tem Frank Nicholson, Councilman Thomas Holmes and Councilman George Attaway. Following recognition of retiring Johnston Town Councilwoman Tara Miller last Monday evening City Attorney, Jenifer Sumner, swore in Thomas Holmes to fill Ms. Miller’s vacated Council seat. 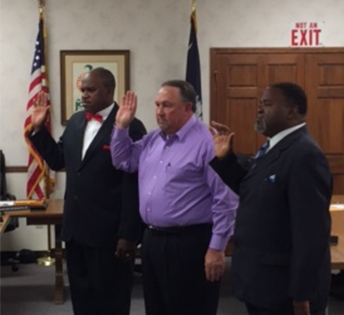 Mr. Holmes was joined by Mayor Pro Tem Frank Nicholson and Councilman George Attaway, both incumbents, in taking the oath of office. Councilman Holmes, a long time resident of Johnston, has previous experience as a Council member and has served on a number of commissions and committees charged with providing service for citizens of Johnston and Edgefield County.